Skid Built Industrial Water Softening System - Robert B. Hill Co. This is an example of a skid built Industrial softening system from the Robert Hill Co. Nearly every component of the system is customizable to meet exact specifications. This system was built for a chiller plant and was designed to be a triplex alternating system. With 2 tanks always online, and the third tank either in regeneration or in standby, the system allows a constant and uninterrupted flow continuous of soft water. Steel vessels can be ASME pressure vessels, which are designed and built per the ASME Boiler & Pressure Vessel Code, Section VIII, Division 1. This type of vessel uses ASME approved materials and welding procedures, are hydrostatically tested to 1.3x the design pressure, and are designed with a 3.5:1 safety factor. All ASME pressure vessels are registered with the National Board and provided with the Manufacturer’s Data Report. ASME vessels can be purchased with a Canadian Registration Number (CRN). A second steel vessel option is a custom engineered non-code or standard non-code pressure vessel. Non-code pressure vessels are designed with a 3:1 safety factor using a broad range of carbon steel and provide an economic alternative to ASME pressure vessels, often with a shorter lead time. Seismically rated supports are available as an option if needed. Tanks are epoxy lined and painted. Our skids are custom built to match the tank and provide the structural support for both the vessels and the plumbing /valve array. Our standard design typically consists of two manway openings in the tanks. Top and side openings aid in assembling the hub/lateral internal distribution system and in loading the gravel sub-fill and ion exchange or filtration media prior to commissioning. This particular application also has a 2” “resin port”. This port is installed just above the gravel sub-fill level to aid in removal of exchange media. The plumbing and valve configuration is also completely customizable to meet design requirements or environmental conditions. Schedule 80 PVC with Bray actuated valves as shown here is our standard design. Welded stainless steel or carbon steel is available as an option. As well as SCH 80 CPVC (Corzan™) or Aquatherm (PP-R) piping. Actuated butterfly valve design allows for low maintenance trouble free operation. Bray Series 30/31 Resilient Seated Butterfly Valves are a One-piece, wafer or lug style valve With Polyester coating for excellent corrosion resistance. A tongue and groove seat design lowers torque and provides complete isolation. The seat also features a molded O-ring which eliminates the use of flange gaskets. The stem is a Precision double "D" disc to stem connection. The close tolerance, double "D", connection that drives the valve disc is an exclusive feature of the Bray valve. Disassembly of the Bray stem is just a matter of pulling the stem out of the disc. Manual butterfly valves are also generally included in the array to allow for isolation and serviceability. Water softener and filtration applications require a certain orientation of valves to complete the regeneration sequence. There are also customizable options for the inclusion of additional manual or actuated valves. In the system pictured above the customer requested manual ball valves on all of the discharge/ drain lines. This allows the ability to monitor and regulate flow to drain in all cycles. It also improves on the ability to connect to a supplied port on the system outlet that provides a consistent solid flow sample port to be utilized through all stages of regeneration for frequent elution studies. PLC style operating controls can be provided to any exacting standards to provide real time display of system operation and flow rates. 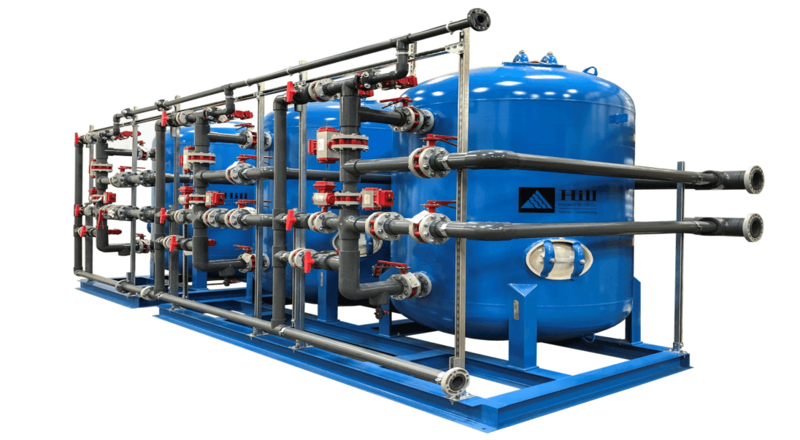 Industrial water treatment equipment & service, wholesale water treatment equipment and commercial salt delivery serving the Minneapolis area. ©2019 Robert B. Hill Company. All rights reserved.